Travel hacking is about tapping on innovative resources and opportunities to keep travel costs as low as possible. This is quite a big deal in the USA where there are often deals and promotions of airline miles for purchases. One interesting story of a travel hacker is that of David Philips who earned 1.25 million airline miles just by buying pudding – he spent about US$3000 on puddings and earned more than enough miles to fly around the world a few times – and travel in style in Business Class as the million miles also earned him the “American Airlines AAdvantage Gold club” which gives out awesome perks like free upgrades! Let’s be realistic here – that happened back in 1999 in the USA. We will probably not get such opportunities here in Singapore but there are still some travel hacks that I have picked up over the past few years of travelling. I will share EIGHT of these Singaporean-style travel hack tips here in this blog post. Just to manage expectations – these are not travel in First/Business Class for a few dollars type of tips, but you can still save some time or money and sometimes both with some of these travel hack tips. We had used an airfare aggregator to secure both our international flights from Singapore to Los Angeles and domestic flights from Los Angeles to Las Vegas earlier during our 2-week no-driving USA Los Angeles – Las Vegas – San Francisco holiday few years back. 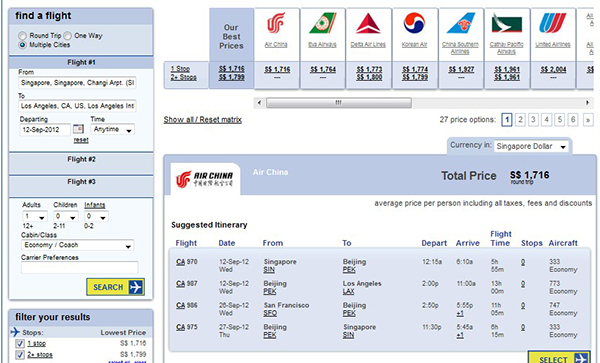 The advantages of using such airfare aggregators is you get all the possible routes (non-stop, 1-stopover etc.) and prices presented on one page for easy comparison. After you have found the best route and price on these airfare aggregators, go to the website of the airline you selected and check the price for the same route. Sometimes you can get it at a cheaper rate (because you had bypassed the middlemen – the airfare aggregators!). This does not work all the time though – it depends on the business model of the aggregator – some impose a middleman commission on the customer; some take the commission from the airline. One example of such travel credit card is the American Express Krisflyer Ascend credit card. You receive bonus 5000 miles when you sign-up for the card and meet the minimum spending requirement. You also enjoy double Krisflyer miles when purchasing air tickets at Singapore Airline websites and its affiliates and more bonus miles when you spend at least $1000 in a calendar month. So if you are a big spender or just use your credit card to make a lot of purchases for work, then you can chalk up quite a lot of miles! This American Express Krisflyer Ascend credit card also provide for travel privileges like airport lounge access. Other travel credit cards in Singapore also offer similar perks e.g. ANZ Travel Visa Signature (for selected airport lounge access) and UOB PRIVI Miles Platinum (for complimentary limousine airport transfer with minimum spending). There are even travel privilege credit cards for the low cost carriers like Tigerair with the Tigerair-Standard Chartered credit card. Do note that there is a difference between hotel aggregators and Online Travel Agents (OTA) and – the former does price comparisons and direct you to the latter to book hotels. Sometimes the aggregator earns their commissions from the customers who book the hotels through OTAs so it can be more expensive to book through an aggregator. OTAs are typically able to secure better deals than what the hotels themselves are offering. This is because some rooms are set aside by the hotels to the OTAs at wholesale rates so as to drive up nightly occupancy rates. So I suggest cutting out the middlemen and go straight to OTAs to book your hotel room. 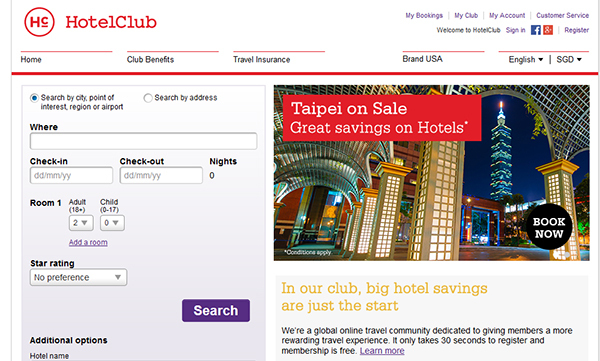 An example of an OTA is HotelClub which also have their own membership programme. Instead of just clocking up each individual chain hotel membership points e.g. Accor points, Starwood rewards, Hilton Honours, you can earn up to 7% Member Rewards (depending on your HotelClub membership tier) for every booking and redeem it in your next travel. It can be used anytime you like at anywhere (hotel) you want. With accommodation choices in 7,400 cities across 141 countries worldwide, there’s a hotel to suit every traveller’s needs at HotelClub. Sometimes, HotelClub offers exclusive members-only hot hotel deals which can only be viewed after logging in. There will also be presales alert so members get access to the best deals first. Membership at HotelClub is free! Other HotelClub Member Extras include access to extra free stuffs such as free upgrade, free breakfast, free WiFi, free kid’s accommodation etc, when you login as a HotelClub member and book accommodation through HotelClub. When we were travelling in Kuala Lumpur, we experienced our fair share of taxi scams – KL taxi drivers refusing to turn on their meter and trying to charge exorbitant taxi fares or a taxi cartel intent on overcharging passengers. We found taxi booking apps like Uber very useful as they have a rigorous system in place to filter errant taxi drivers (passengers can rate and comment on the drivers). Also, with taxi fare payment by credit card through Uber, we can have a record of the taxi fare in the system and raise a fare dispute later if required. Food is what we Singaporeans always look out for when travelling – skip the tourist traps and go where the locals go – this takes a bit of research at sites like Openrice, Yelp and their local versions of Hungrygowhere and blogs. 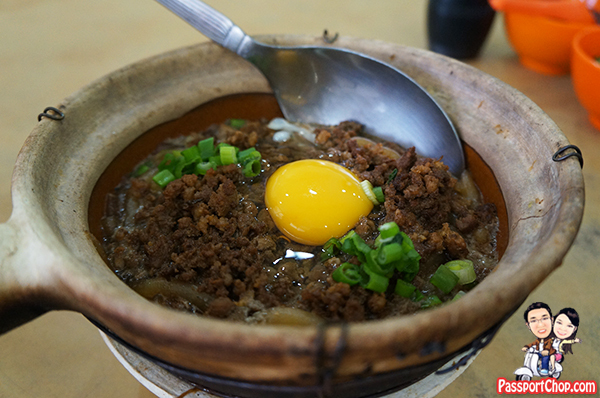 For example, I have compiled a list of the best eats around Kuala Lumpur and at Imbi Market. 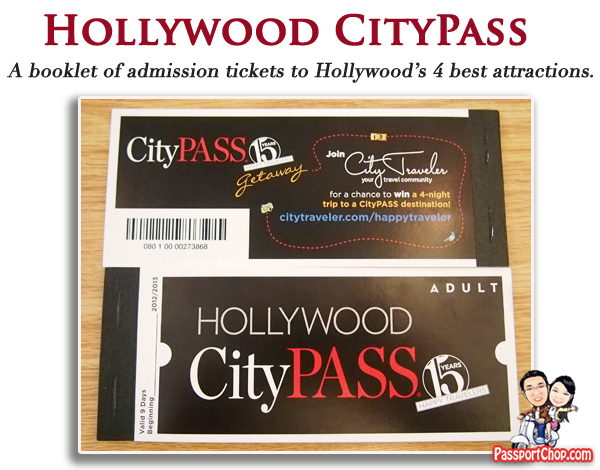 During our visit to Hollywood, we had the Hollywood CityPASS which saved us more than 40% on admission to famous attractions and tours in Hollywood. Not all city day passes are worth the money – map out your itinerary first and identify the must-see and then look at what the city passes offer. Key questions to ask yourself – are you able to skip queues with the day pass and are you able to achieve savings using the day pass – if your answer is yes to both, then get one. This might seem very common sense but not everyone does this. There are often early-bird discounts for some attractions and shows. The NANTA Cookin’ performance in Seoul is one such example – the show is so popular that it is almost impossible to buy over-the-counter tickets – it is sold out almost every night. NANTA has lots of discounts and package deals when you buy online. If you are planning a trip to South Korea, you can actually do a lot of bookings online for attractions and guided tours like the Koridoor DMZ/JSA tours so it is very convenient. So there you have it – 8 travel hacks or travel tips – whatever you call it – they sure save some time and money for us when we were travelling to those places. Contest ends 17 Nov 2014, 11.59 pm SGT. Hurry and share your #Travelsmart tips now! Winners will be announced on 11 Dec.
Online travel agents can really help you save time as well as money as they know which hotel can be booked for you based on your budget and schedule. Taxi can be a pain, and taxi booking apps will help keep you away from drivers who are out for an extra buck on your expense. Very nice tips, thanks for sharing!